You're probably familiar with the phrase "canary in the coal mine." Years ago, miners brought these little birds with them when they went below ground to work. If there were gases in the mine, the canary expired before the humans were affected, providing a warning so they could escape. Today, sentinel chickens are the first line of detection for certain diseases. Sentinel chickens are used primarily for detection of the mosquito-borne West Nile virus, which causes a brain infection in people, horses and other animals. That's because chickens become infected with WNV if bitten by mosquitoes, but don't develop symptoms of the disease. Their bodies develop antibodies to WNV within a week of being bitten by an infected mosquito. Public health officials know that the potentially deadly disease is in a particular vicinity because of the sentinel chickens' response. 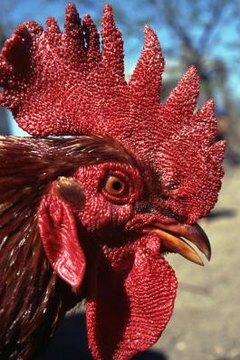 Chickens are also used to monitor for the presence of another viral brain disease: eastern equine encephalitis, or EEE. Any type of chicken can serve sentinel duty, but they must be young birds. That's because only chickens with limited exposure to any possible arboviruses, or viruses transmitted by arthropods, can be used. These arboviruses include the encephalitis viruses transmitted by mosquitoes. Chickens must test negative for these viruses before they become sentinels. Usually, municipal, county or state health officials place sentinel chickens in cages in various locations. Typically, birds are caged in groups of six. Sentinel chickens receive good care, with adequate food, water and regular cage cleaning. Every two weeks, or more often in some localities, officials draw blood to test for the presence of WNV or EEE. If a chicken turns out positive for antibodies, local mosquito control commissions spring into action to eradicate mosquitoes in the area, while public health officials warn the populace. Sentinel chickens generally serve during WNV season, June to October, although their run might be extended for a while in hot climates. What happens to them next depends on local policy, but since these birds are in the public eye, they generally aren't slaughtered. Some might be adopted out to backyard chicken keepers. In Hillsborough County, Florida, former sentinel chickens range free on a local farm for troubled teenagers. What Is Coggins Disease in Horses?